The 2008 Dodge Challenger SRT-8 is a reverent reinterpretation of one of Mopar’s quintessential musclecars, the 1970 Challenger. 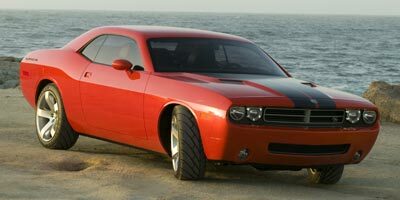 A near clone of the well received 2006 Dodge Challenger concept, the super-high-performance, 425 hp SRT-8 is the first Challenger model to be launched. With a base price of $37,320, the SRT-8 will be the top of the Challenger line and will be joined later in the year by the less expensive R/T and SE variants, powered by 340 hp V-8 and 250 hp V-6 engines, respectively. As a first-year model of what could be a dying breed, the Challenger SRT-8 is rare, collectible and pretty damn cool, if you ask us. Nothing says badass like a quartet of scowling, scalped headlamps, even if the centermost two are amber daytime running lamps (DRLs). The mood, flavor, sounds and acceleration each evoke nostalgia for all things shaggy. Road-holding, however - a notoriously weak aspect of early muscle cars - is mind-blowing, particularly when one’s SRT-8 is equipped with sticky summer Goodyear tires, a bargain 50-dollar option. The dark, all-black interior is rendered in some mighty cheap materials. The rear-seat legroom is, well, as restrictive as one would expect in spite of there being three seatbelts back there. Steering is numb as your lower lip after getting a filling. And, oh yeah, there’s that atrocious, harkens back to the 70’s fuel economy. Musclecars are expected to get out of the traps in a hurry, and true to form, the Challenger SRT-8 certainly does, with a claimed 0-60 time of a tick over five seconds. That said, we think that anything with 435 horsepower and 420 lb-ft of torque should be even faster. Blame the 4140-lb curb weight, evidence of the Dodge Charger sedan platform on which the Challenger is built. We also wish the steering had more feedback - or heck, any feedback at all. But the deeply bolstered seats are snug, and there is plenty of elbowroom for front passengers. Riders in back, however, will be somewhat claustrophobic due to the Challenger’s small, fixed rear windows and tight knee-room. The Challenger SRT-8 has a 6.1-liter, V-8 engine mated to a 5-speed automatic transmission with manual shifting capability - tap the gear lever left for downshifts, right for up-shifts. To return it to automatic, just hold it to the right for one second. The engine produces American-made amounts of horsepower and torque, and sounds sharp, refined and fantastically muscular under full throttle. The 2008 Challenger SRT-8 will be a commemorative model, with certain key features that will not be repeated in 2009 (see sidebar). The SRT-8 also comes with a cool “Performance Featuresâ€ display in the center console that shows any one of the following performance measures in real time: 0-60 mph, 1/8-mile or 1/4-mile acceleration, 60-0 braking distance, or four-way (front/rear/left/right) g-forces. Warning: that Performance Features display can cause addictive, I-can-do-better-than-that! driving behavior. For some levity, watch the fuel gauge. Chrysler’s SRT (Street and Racing Technology) team tuned the engine, transmission and suspension to a remarkably high level of performance. The Challenger SRT-8 also debuts SRT’s new “brake knock-backâ€ system, which senses assertive driving behavior (such as on mountain roads or racetracks) and pressurizes the brake lines to bring the pads close to the discs for quicker braking response. With fuel economy of 13 mpg in the city, 18 on the highway - and that’s with the EPA’s feather feet, the 2008 Challenger SRT-8 isn’t exactly what anyone would call green, even if any shade of green was on the palette. Then again, if you’re looking at a car like this, you probably don’t care, just like the 70s. The optional moonroof is a must-order for claustrophobics that might not dig the Challenger’s dark interior and low-slung roofline. But the SRT’s 700-watt stereo is a paragon of clarity and deep, resonant bass. Chrysler claims that it is nearly impossible to blow the speakers. Your eardrums, well, that’s another thing. The blocky exterior shape speaks for itself, but in fact, aerodynamic elements have been carefully honed, including the hood contours, the retro-chic mirrors, and the cool matte black rear spoiler. And those 20-inch wheels are as hot as this year’s Pirelli calendar. The Challenger SRT-8 isn’t cheap in the grand scheme of things, but for this much horsepower, it’s actually not too bad. The base price of $37,320 includes everything but the sunroof ($950), a navigation/audio system with 20 gigs of memory for MP3s ($850), and the Goodyear F1Supercar summer tires ($50). The destination charge is $675. This is cheaper than most of other Chrysler’s other “SRT-8â€ products, if a bit pricier than most Mustang GTs. Then again, at 40 grand fully loaded - with guaranteed collectible status tossed in for free - the 2008 Challenger SRT-8 can be seen as somewhat of a performance bargain. The Challenger is far from perfect, but we like it. After all, musclecars have one purpose in life: to go fast, and sound great doing it. The fact that the Challenger SRT-8 can hold onto the road with tenacity and has a great stereo should be seen as bonuses. Leave the carpooling duties to the sport-ute on the other side of the driveway. First-year models of muscle or sports cars, such as the 1964 1/2 Ford Mustang and 1953 Corvette, tend to be among the most collectible of their kind. However, in spite of the new Challenger not being technically the first year of the Challenger, Dodge hopes that the 2008 Challenger SRT-8 will become a collectible icon in its own right. For starters, the SRT-8 model alone will be offered as a 2008 model; R/T and SE models will be introduced as 2009s. Next, all 2008 SRT-8s will come with faux carbon fiber clear-coated hood stripes whereas the stripes will change to a matte black for 2009. Inside, each front seat in the 2008 Challenger SRT-8 features an orange stripe on the seatback, a stripe that will turn red for 2009 models. Finally, a commemorative, numbered plaque on the passenger side dash pad will mark each 2008 SRT-8’s spot in Mopar history. Want one? Better hurry. Only 6400 will be made for the American market for the 2008 model year, and most of them are already taken.